Snackbot is an autonomous mobile robot whose mission is to bring you tasty treats! Carnegie Mellon researchers have certainly nailed down a lucrative customer demographic for this bot. Snackbot is meant as an ongoing platform for research. 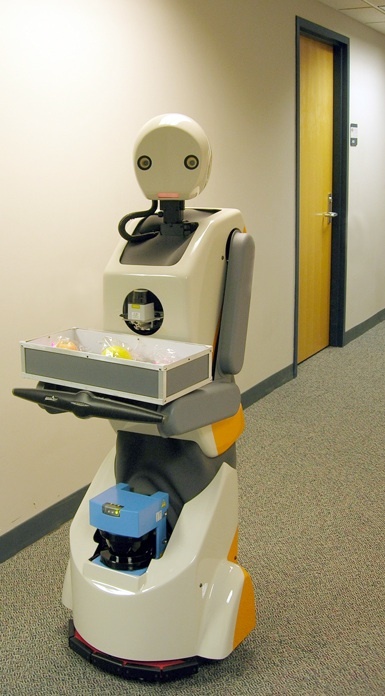 The Snackbot will support research into robust autonomous operation in office environments. Our efforts range from multi-sensor fusion algorithms for perception, reasoning about dynamic spaces,communicating with people through verbal and non-verbal mechanisms, and planning with incomplete information. The research will allow the robot to navigate through congested areas in a socially acceptable fashion, detect individual people moving near the robot, recognize when someone that the robot knows approaches it, and autonomously learn to recognize new objects. Carnegie Mellon's website insists that Snackbot is a research platform on all kinds of cool topics, like "behavioral science research on such topics as personalization" and "people’s relationships with interactive objects". But I think that CMU researchers want fresh snacks! And why shouldn't they? Hard working engineers who build our robotic future need fuel, too. Are there any science fictional robots that are bringers of snacks? You bet. 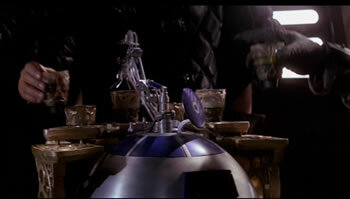 For example, fans may recall Star Wars' Artoo Detoo in a snack-carrying capacity on Jabba's sail barge. 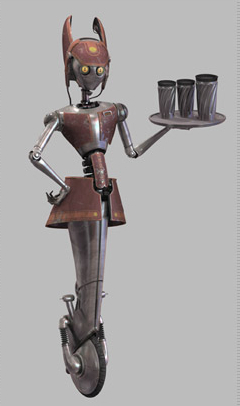 And don't forget the waitress robot WA-7, the robotic waitress from Dex's Diner in Star Wars II Attack of the Clones. Learn more about Snackbot at Carnegie Mellon via BotJunkie.